Reality check – Renault Clio R.S. Does this Renaultsport make sense on paper? This time round, Lenspeed will take a more statistical approach to this story and leave most of the driving impressions for a separate article. We’ll also offer our opinions on Renaultsport’s direction, which can be argued as mildly controversial and a talk of the town in the petrolhead world. Let’s start off with numbers derived from the powertrain. 200bhp squeezed out from a 1.6-litre turbocharged motor shared with the Nissan Juke sounds just about right for it to have more than sufficient poke. Interestingly, it’s a horsepower output that is identical to the MkV Volkswagen Golf GTI. As it stands, it should be no less sprightly than the MkV GTI, with the Clio R.S. having a weight saving advantage of at least 120kg over the German. 240Nm and a century sprint time of 6.7 seconds are nothing to shout about to be honest, but these numbers are still positive figures even by modern standards. 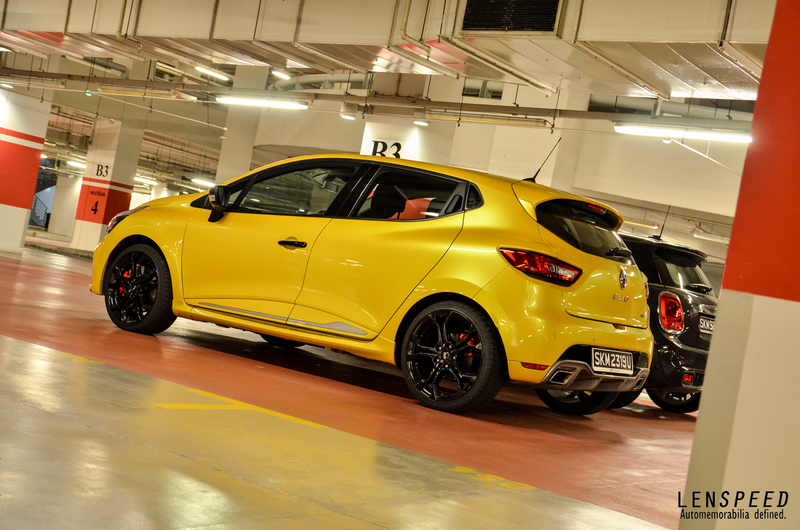 There are more similarities to the German hatchback, with the Clio R.S. now being offered in only five-door guise, with rear handles hidden “Alfa-style”. Cabin space is generous too, just like what we recall from the MkV GTI. And it now comes with a six-speed dual clutch transmission, a gearbox that transformed the Golf into a serious contender in the hot hatch kingdom. We understand that this particular Efficient Dual Clutch (EDC) gearbox is also found in the Megane Diesel, but we’re not wiping out its effectiveness and level of engagement based merely on this less “driver-centric” association. While the Renaultsport Megane R.S. 265 Cup was a more practical hatchback (by Renaultsport standards of course!) when pitched against the Clio 200 Cup, this Clio is slowly growing to be the more practical and usable performance hatch in Renaultsport’s hierarchy – an interesting approach considering that the 200 Cup was a no-nonsense pocket rocket. We can only fathom a wild guess that future iterations will only get physically larger and heftier. We will not want to delve into full fledged driving comparisons as detailed face-offs with the Clio 200 Cup and MINI Cooper S will be made following this. Objectively speaking, the Clio R.S, can still put a smile on your face when you put it through the paces. It still dials you in by tempting you to extract plenty of talent available from the “1.6T Cup” variant fitted with the Cup Chassis (a $3000 option over the “Sport” variant, along with red brake callipers, a reverse camera and 18″ gloss black rims) although it must be mentioned that the gearbox-engine paring could nullify the manic experience we loved so much from our years of hot hatch experience. Back to our focus – can we recognise the dilution of “Renaultsport” roots based on what we gather on paper? Yes, of course. A stick shift is sorely missed, and a more urgent engine would be preferred. But harping on these facts would be too narrow a perspective. When we assess the situation holistically, it makes plenty of sense from a business perspective. A larger target market would likely benefit from this Clio R.S. that has grown in practicality, efficiency and real-world performance (it supplies stacks of low end torque low down the rev range, making city driving a breeze). It might be down on fun and driver engagement – a huge pity considering the potential of Renaultsport engineers. But that seems to be the way tuning houses are moving towards, albeit reluctantly from a petrolhead perspective, but logically from a business point of view. And we have to understand their difficulty and dilemma to blend driving fun with mass-market appeal – two distinctive attributes that will never, ever cross paths without compromise. Still, the Clio R.S. might be the car that best reflects the way in which this clash of interest can be minimised, and we reckon that this could be one of the better bets for a modern performance hatch.